You can change system settings to customize your Mac. 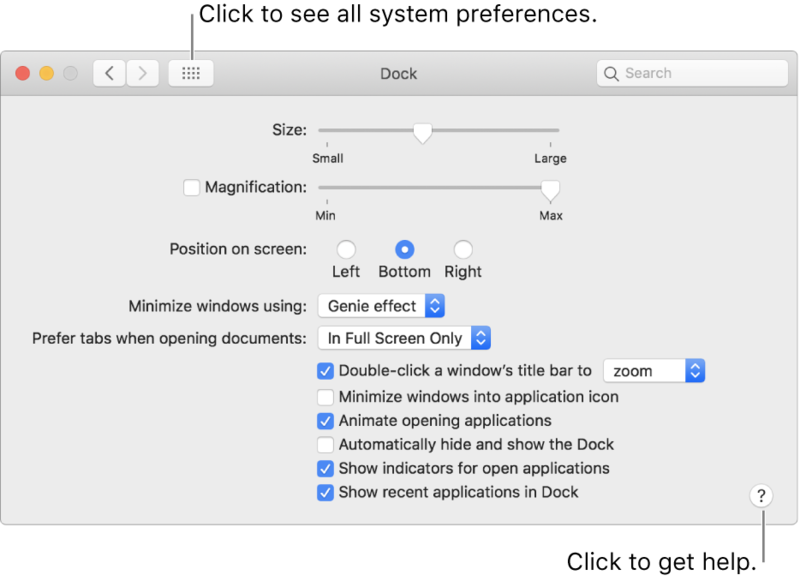 For example, you can change the size and location of the Dock, choose a light or dark appearance, change the desktop picture, and more. To change System Preferences on your Mac, click the System Preferences icon in the Dock or choose Apple menu > System Preferences. Options for your Mac are organized into preferences. 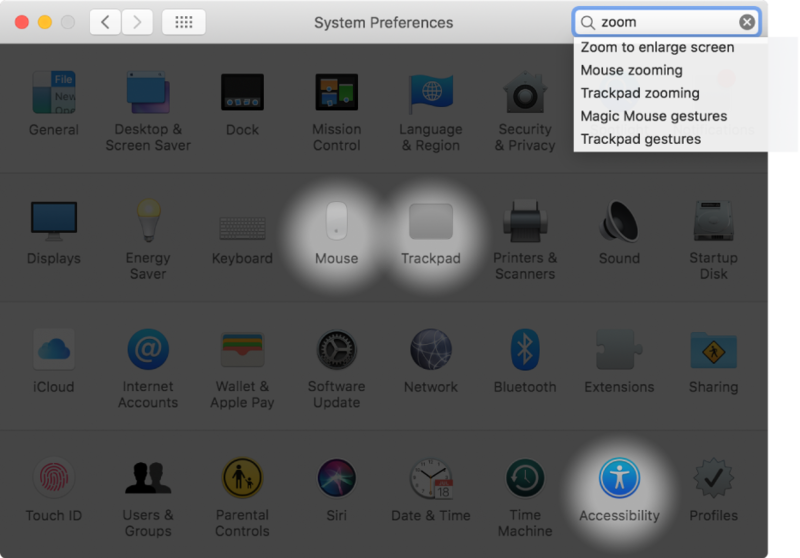 For example, options you can set for Spotlight are located in Spotlight preferences. 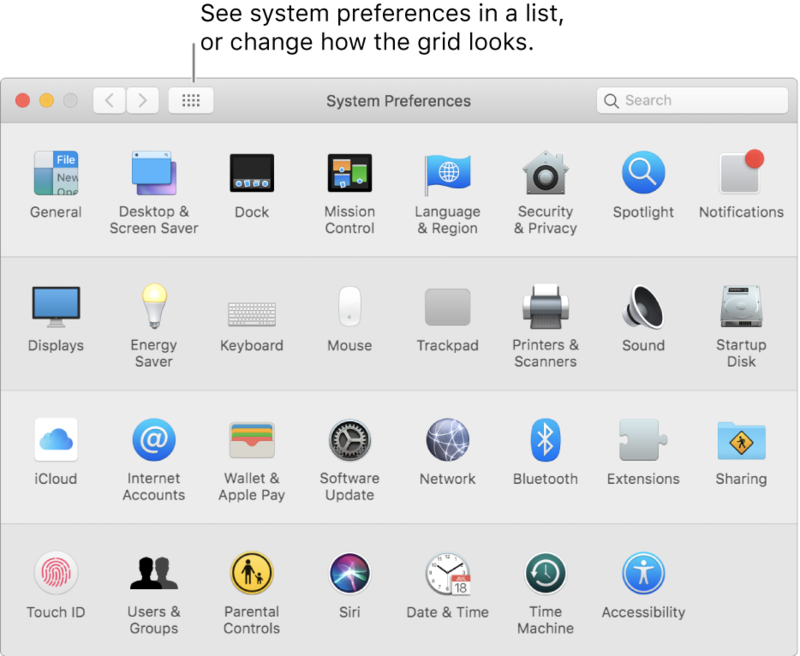 Preferences appear as a grid of icons; the icons shown may vary depending on your Mac and the apps you have installed. Click an icon to open a preference pane and see the options. By default, preferences are arranged in rows by category. To see them in alphabetical order, choose View > Organize Alphabetically. Each preference pane contains options you can set. Most panes include a Help button to click for more information about the options. Some panes are locked to protect your Mac, indicated by a closed lock icon at the bottom of the pane, and the options are dimmed. To unlock a pane so you can set options, click the lock icon, then enter the administrator password for your Mac. If you don’t know where to find an option in System Preferences, use the search field at the top of the window. Options that match your search text are listed, and the preference panes where they’re located are highlighted. If you see a red badge on the System Preferences icon in the Dock, you need to take one or more actions. For example, if you didn’t fully set up iCloud, the badge appears on the icon in the Dock; when you click the icon, iCloud preferences are displayed so you can complete setup. To change options for an app, such as Mail or Safari, open the app, click the app’s name in the menu bar, then choose Preferences.